Melony and Sheahan make their way up to the top chamber, called Campbell's Chamber. I'm still firing into pitch blackness, here. 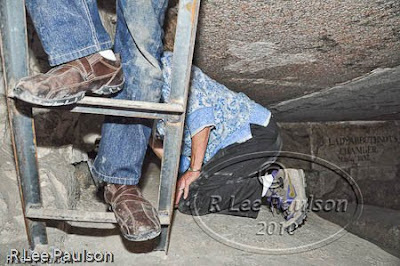 As you can see, the width of one of the huge, red granite joists is as wide as Melony's torso. The others, got up to the top chamber before me. Carrying all my camera gear took me considerably longer to negotiate the steep ladders. Notice the different heights of the red granite joists used here. I'd be interested to know why they are so different. Again, in this chamber as in the others, I simply randomly pointed my camera in the dark and blindly took as many photos as I could. Notice that everyone in the picture above has a flashlight. West insisted upon it. We were glad he did. Otherwise, we never would have been able to explore these chambers. If you go, be sure and take one yourself. One never knows what opportunities may open up for you if you do. Another, longer view of this top most chamber. In these chambers somewhere, and I didn't see them, there simply wasn't time to look, are inscriptions which supposedly identify Khufu (Cheops) as the builder. There is a huge controversy surrounding these inscriptions. And, as with most things, concerning ancient Egypt, multiple theories abound. 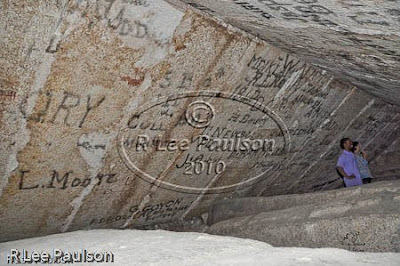 Bottom line: We'll never know for sure if those inscriptions are authentic or not. I pointed my flashlight at my watch and noticed that our hour was half over. It was time to begin working our way back down. Here is another view, this time from the top, of the small hole by the first chamber through which one needed to crawl in order to get down. The shiny spot near the edge is where we sat, dangling our legs over the ledge and then slowly twisting ourselves to get a toe hold on the ladder below. I'm back at the top of the ladder in the Grand Gallery. My head is almost touching the 28 foot ceiling. I took a bunch of shots from up here, trying to get a good one. My flash was turned off because it was not strong enough to light the entire length of the 157 foot chamber. This isn't great but it is not too bad for a 1/2 second hand held exposure made while standing at the top of a rickety ladder. I continue to be hugely grateful to the guys who invented VR lenses. The tiny hole at the end of the rails is the exit tunnel. I have now worked my way down to the tiny entrance hole and am looking back to where the last image was taken. Look closely at the opposite end and you can barely make out the ladder I just climbed. It goes diagonally from bottom right to the upper left of the end wall. The other diagonal you see from lower left to upper right is a wooden plank that they have tied to the ladder in order to brace it. The brace comes at the joint were two individual, shorter ladders have been lashed together to make a taller one. I can't complain. It wobbled a lot, but it got the job done. 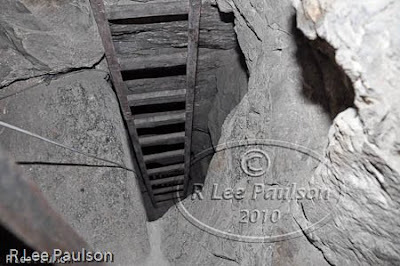 The King's Chamber entrance tunnel is at the end of this chamber, underneath the ladder, on the left. Light from inside that tunnel illuminates the lower part of the back wall. It is a different color temperature than the lights used in the Grand Gallery. 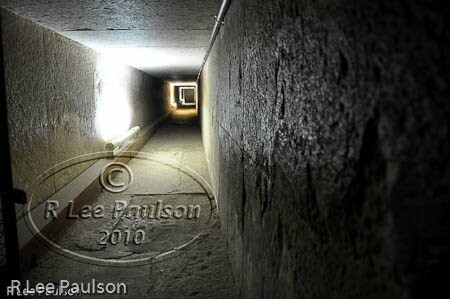 Standing at the bottom of the grand gallery facing down, I turned right and entered this tunnel to the Queen's Chamber. Here is one end of the Queen's chamber, taken from the entrance looking right. The white, plastic thing on the wall to the left is a camera and intercom system. Notice the sloped ceiling. 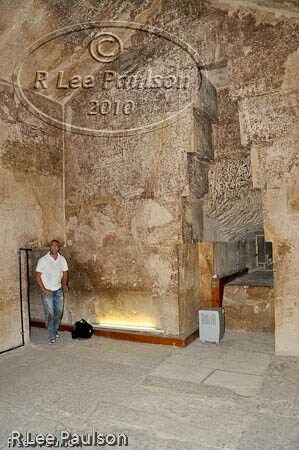 These walls are made from plaster covered limestone, not red granite as in the King's chamber. About that, West says, "In naming the chambers King's and Queen's, Al Mamun's reasoning may have been mistaken, but yet accurate in a symbolic sense. The plaster-over-limestone walls suggest a deliberate "water" or feminine symbolism, as opposed to the masculine or "fire" of the granite of the King's Chamber. If anyone ever succeeds in establishing a valid scientific basis for pyramid power it will be interesting to see if the symbolic polarity reflects itself in detectable physical differences in these two chambers." I'm now looking at the other end of the Queen's Chamber as Mike enters through the tunnel. My camera case is on the floor next to his feet. West says that some have claimed there was a statue in this niche at one time. However, no statue has ever been found and he suggests the fact that this niche is off center precludes that. No one knows why the niche was incorporated into the design. 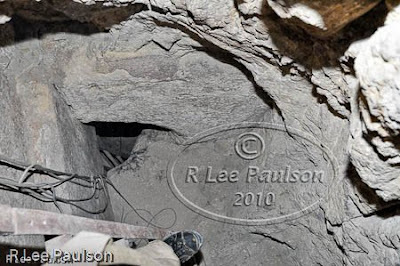 There is a blocked off tunnel inside the niche, but that was dug sometime in the past by treasure hunters. It leads nowhere. 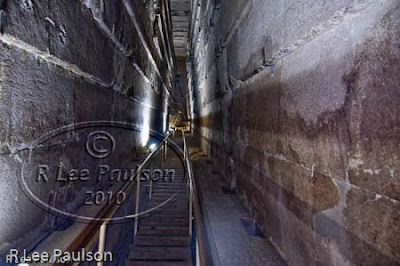 This image is unremarkable in many ways, but I decided to include more images instead of less inside the Great Pyramid. I wanted you to see the small hole that at certain points in time lined up with important stars, assuming of course that the casing stones hadn't yet been placed. It was in one of these small holes that small robots were inserted not long ago looking to see what was at the end of the tunnels. The robot drilled through one obstruction, inserted a small camera through the hole it drilled and all they saw was another obstruction. Next time, we work our way down into the subterranean 'pit' chamber. Continue on to Post 41: Great Pyramid III by clicking here. 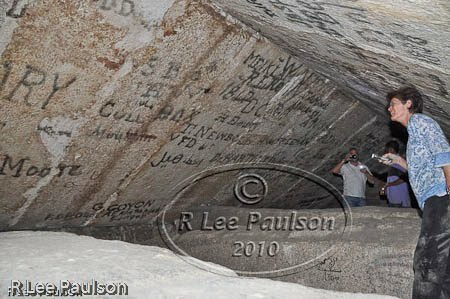 you wrote "There is a huge controversy surrounding these inscriptions. And, as with most things, concerning ancient Egypt, multiple theories abound. 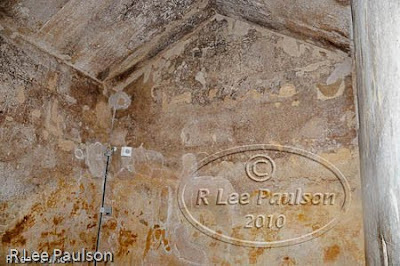 Bottom line: We'll never know for sure if those inscriptions are authentic or not." "They are not forgeries, very simply, because there are dozens of other crude inscriptions up there done by the same quarry gangs, and all are stylistically the same, daubed in the same red ochre, and it is absolutely clear - once you have been up there - that they date from the same period, and all are ancient. OK? " "In Fingerprints I supported the Vyse forgery theory. Later when I got into the relieving chambers myself and saw that some quarry marks disappear far back into the gaps between the blocks I felt that I must be wrong to support the forgery theory -- because no one could have got a brush into those gaps to carry out the forgery. Therefore the quarry marks must be genuine and must have been put on the blocks before they were put into place in the chamber. Accordingly I retracted the position I had taken in Fingerprints. It's possible I threw the baby out with the bathwater with that retraction. 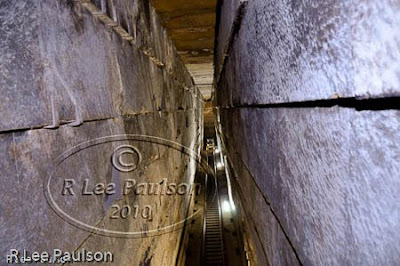 Unlike the unforgeable quarry marks positioned between the blocks, the Khufu cartouche is in plain view and could easily have been forged by Vyse. I do not insist it was, I just accept that it could have been, and that some interesting doubts have been raised over its authenticity. I await further evidence one way or the other." 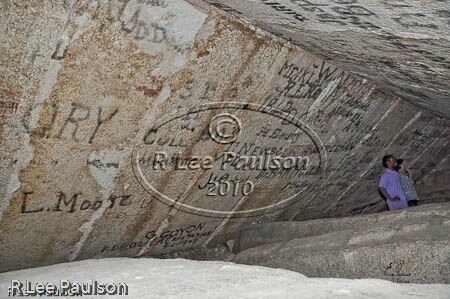 The pictures in your page are very small and it is very difficult to see something clear on the stones (apart the horrible writings of the past time visitors), so I need to ask if you took a closer look at those inscriptions. Can you confirm that inscriptions "disappear far back into the gaps between the blocks" as Hancock wrote? Last question: can you show some picture showing the marks? "The truth is hidden in plain sight"
They are equations based on the measurements of the Earth - Geomathematics - they teach geometry, mathematics and they gave us the Imperial Statute measurement system. All of our written history is full of mistakes based on calculations being made using theories rather than facts to make assumptions ... either that or a blatant lie. I can't tell you who built the pyramids ... BUT ... I can tell you they definitely were NOT tombs - no mummy has ever been found in a pyramid - they were all put to rest in the Valley of the Kings. 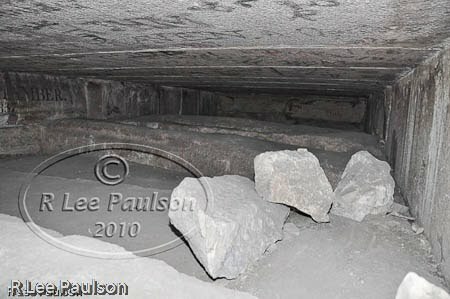 The pictures we are shown in documentaries give the impression these tombs are inside the pyramids when this is far from the truth. Whatever was in the box inside the great pyramid was removed through a small hole smashed into its side as the lid (which has since been removed) was too heavy to lift.